British official press photograph (Air Ministry). Approximately 26 x 20cm. 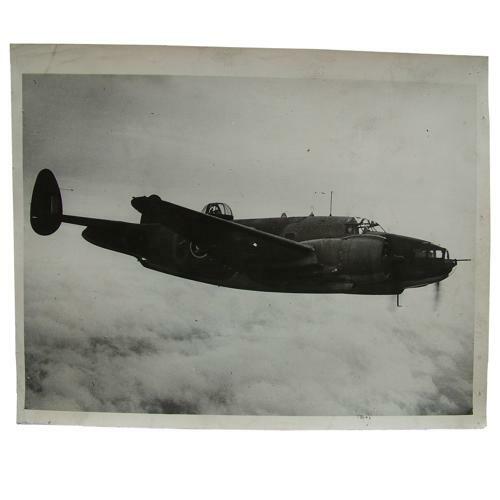 Shows a Lockheed Ventura light bomber in flight. Captioned to rear 'Ventura light bombers were first officially mentioned as being in service with the RAF after the daylight raid on the Philips radio works at Vinhoven, Holland, December 6, 1942. The Ventura is a development of the Hudson - first American built aircaft to go into operational serice with the RAF in this war...' A little dog-eared/creased with pin holes at the corners but generally good. Stock code P22873-99.